Long-time readers: by now, you should know the drill. Here’s a photo. Below there’s a draft of something. And then I explain it all. Outside, on the driveway, the dozen black garbage bags stacked up against the siding are beginning to stink. Inside, the bleach is reacting with the glue in the particle board and my head is swimming. The beer is warm. The drawer is still missing. I wonder if she kept everything that was in it — the kitchen shears, the rusted churchkey, the ball of twine, the ladle, the steak knife, the egg timer. I doubt it. She hadn’t said she wanted any of that. She just wanted the drawer. Not even that, really, because what the hell do you do with a drawer? She didn’t want to take anything from me. What she really wanted was to leave me with something. This hole. Every time I walk in the kitchen, reach for a beer or fill a glass at the sink, there’s the hole. Here I am, it says. This is what I did to you. But it’s okay. I know she kept the drawer. Even if she trashed everything that’s in it, she kept the drawer. Maybe it’s not in her kitchen, maybe it’s in her garage, or her basement. Somewhere she rarely goes. But she goes there, once in a while, and when she pulls the string on that bare lightbulb, there it is, white and tilting on the shelf beside the dryer. There he is, it says. This is what he gave you. 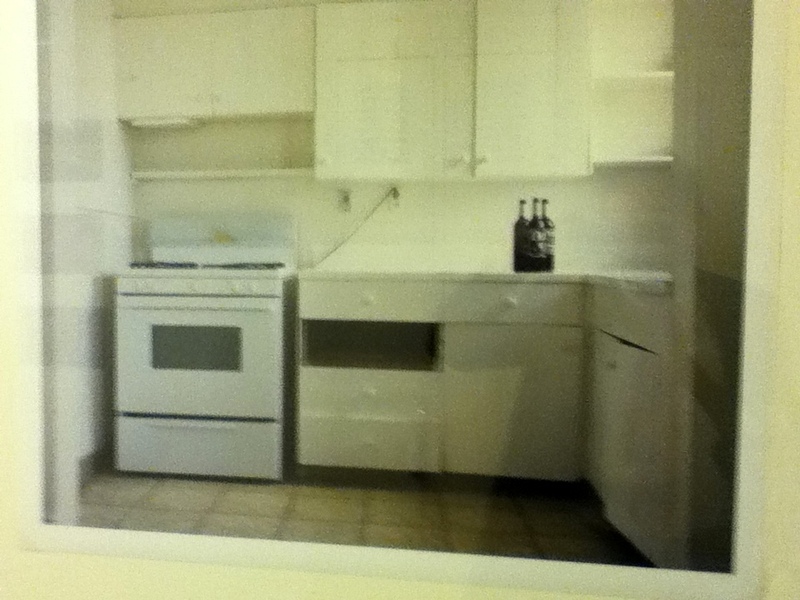 I spotted this photo in a hallway at Pacific Northwest College of Art, where I started teaching this week. I love student gallery space — the work is so fresh and daring as people try to figure out how they want to express their art — and so I spent a lot of my free time wandering the halls examining paintings, sketches, sculpture, installation pieces, photographs, and so on. There’s a LOT of really fascinating work there, but this photo immediately made me want to write a story. As a story, this is really pretty flawed. It doesn’t really make sense without the photo, I think. And while I like how short it is, it’s relying too heavily on a cliché situation and overt psychobabble. Still, that hole in the drawers is what draws me to this photo — that’s where the story is — and that demands a kind of brevity and highly imagistic or figurative language, I think. So, whatever this winds up being, that’s the direction it’s headed. You amaze me that you can find a story almost anywhere, anytime, about anything. Guess that is the writer in you. The rest of us aren’t looking at it that way, and sad for us, as there is always a story to tell which is why you are such a great teacher. I will be sure to relate this to teachers I know and wished I had thought to use this concept when I was teaching writing. Again you amaze me! You know, I should have added this anecdote to my post, but I’ve used it twice already — students and writers who know me have heard it far more often — so I didn’t want to get repetitive. But now that I’m thinking about it, I may as well mention it again: Francine Prose, in her book Reading Like a Writer, relates an anecdote about Chekhov. “Once, when someone asked him his method of composition, Chekhov picked up an ashtray. ‘This is my method of composition,’ he said. ‘Tomorrow I will write a story called “The Ashtray.”‘” I love that anecdote, and I’ve often intentionally used it as a starting point. In fact, the last time I mentioned this Chekhov story, it was regarding another Writer’s Notebook post, and I did indeed included an ashtray in that one! I have to agree with your Moms here, A great visceral bit of writing. I love what you did and how easily you seemed to do it. Best of luck at Pacific Northwest College of Art, You’ll do something great for them if you show them this example, then ask that they try their hand at brevity. The moment a light-bulb comes on, one of those energy-saving ones under which the galley is only half awake.